The family of a woman who died in a speedboat crash on the River Thames hope to take their safer waterway campaign to the prime minister. Charlotte Brown, 24, died after Jack Shepherd's speedboat crashed and capsized in the Thames in 2015. Shepherd was jailed for six years for manslaughter, but the trial was held in his absence and he remains on the run. Theresa May called the case "shocking" and said Shepherd "should give himself up and face justice." When asked a question about the case at a joint press conference with Japan's Prime Minister Shinzo Abe, Ms May said "the secretary of state for justice had asked officials to look into the issue" of Shepherd still receiving legal aid for his appeal. During Shepherd's trial it was revealed that anyone can hire a boat for personal use without training or a licence. It is also not mandatory to wear or carry a life jacket. Ms Brown's family hope to bring in "Charlie's law" for waterways - a law that would police and bring in safety measures for privately rented boats. 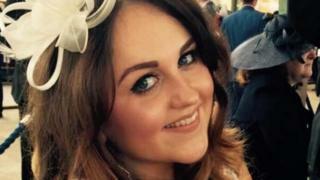 Her sister Katie said: "Jack Shepherd's reckless actions resulted in my sister's death. We want to prevent that from happening to anyone else." Ms Brown's mother Roz Wickens said she was doing her best to lead the campaign for tougher regulations on the water, but has suffered some knock backs. "If the Prime Minister will listen, we would definitely take it to her. We really appreciated her recent comment that showed her acknowledgment of our situation." Ms Wickens said the lack of a law was causing "unnecessary deaths". "For such a big country surrounded by water and so many rivers, we're behind the times with this," she added. The family is due to meet with Home Secretary Sajid Javid on 22 January to discuss the next steps. Image caption Jack Shepherd told police he had bought the speedboat to "pull women"
Ms Brown, who was from Clacton, Essex, was on a date with Shepherd when he took her out on the Thames in his speedboat. His trial heard the defective boat was being driven "at full throttle" when it hit a submerged log or timber and capsized near Wandsworth Bridge. Ms Brown's family also spoke about their anguish that Shepherd has been given permission to appeal against the conviction, in spite of his disappearance. "He's still on the run, he hasn't served a day of his sentence and he's been allowed to still be in communication with his lawyers," Katie said. "It's just prolonging the agony for everyone. It's just not right."